Even Stronger Connections: Eastern Communications celebrates the 2nd year of its Eastern VIP Link Club - Hello! Welcome to my blog! 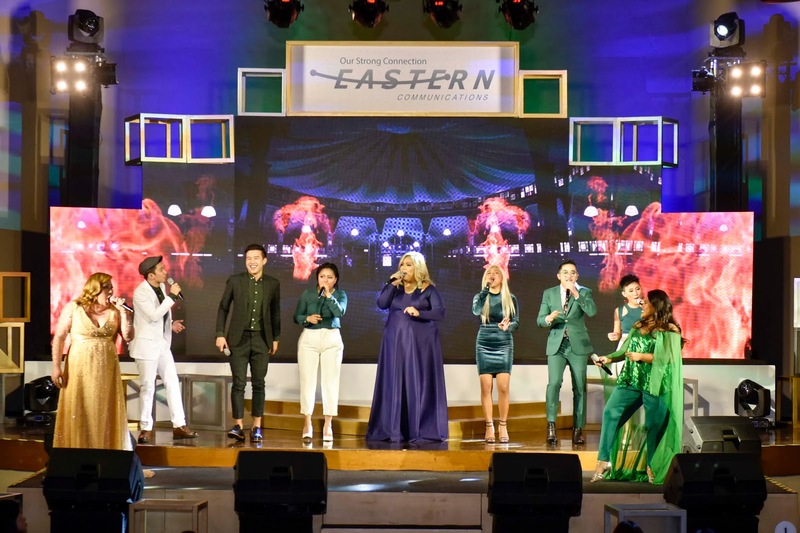 Guests at the Eastern Link VIP Night were treated to an evening full of amazing musical performances from theater artists Isay Alvarez and Robert Seña, music diva trios Bituin Escalante, Frenchie Dy and Radha Cuarado and world-class acapella group Pinopela. Through an evening full of delightful entertainment, Eastern Communications celebrated the second year of its client recognition program dubbed the Eastern VIP Link Club. At a gala dinner at the Manila Hotel, guests were treated to a program with amazing musical spectacles as they once again experienced Eastern Communications’ High Touch service with performances from renowned theater artists Isay Alvarez and Robert Seña, music diva trios Bituin Escalante, Frenchie Dy and Radha Cuarado and world-class acapella group Pinopela. 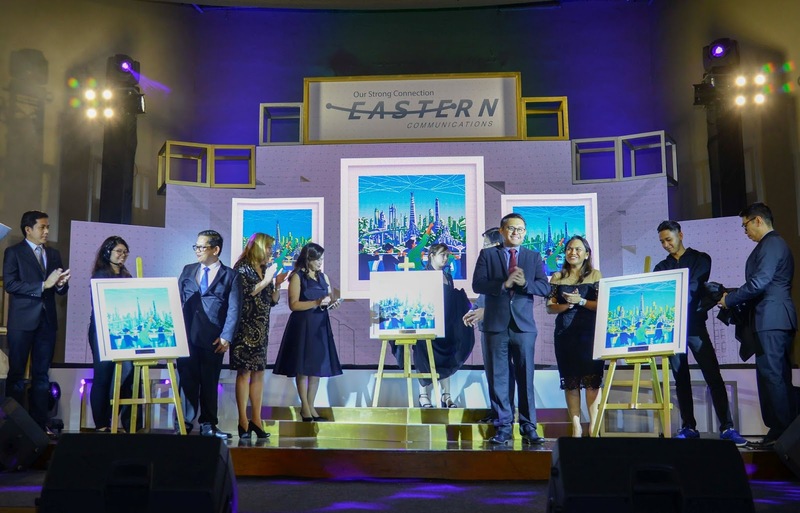 Eastern Communications executives unveils masterpieces created by renowned artist Jap Mikel during the Link VIP Night. These were especially commissioned as a token of appreciation for their long-term clients. Eastern VIP Link Club members from different industries were also acknowledged and given a one of a kind digital artwork by artist Jap Mikel as token of appreciation for their continued partnership with Eastern Communications for many years. Eastern Communications defines its unique branding as both “High-Tech and High Touch”, a two pronged approach where they not only deliver innovative products and services that are at par with the standards of the telecommunication industry but also provide customer support that goes above and beyond the norm, offering clients personalized service and customized solutions to fit their company’s business needs. The Eastern Link VIP Club, created to thank customers for their continued loyalty to the company, is one example of their commitment to “High Touch” service. Highlighting their appreciation to their loyal partners, Eastern Communications Coordinators Atty. Aileen Regio and Mr. Ramon Aesquivel welcome guests and long-time customers as they celebrate the 2nd year of the Eastern Link VIP Club at the Manila Hotel. “This year, we continue to recognize our clients who have continuously trusted Eastern Communications for the past years by treating them to a night where they can experience our great local musical talents. Above our promise of providing strong connectivity and innovative tools that are helpful to their business, we are committed to providing extraordinary customer service to help achieve their business goals,” said Ramon Aesquivel, Eastern Communications Co-Coordinator. The Eastern VIP Link Night was also an opportunity for the company and its customers to give back as a donation was made in the name of each guest by Eastern Communications to Humanility, a non-government organization that aims to emancipate and empower victims of poverty and children at risk through compassionate care and sustainable economic and educational development. 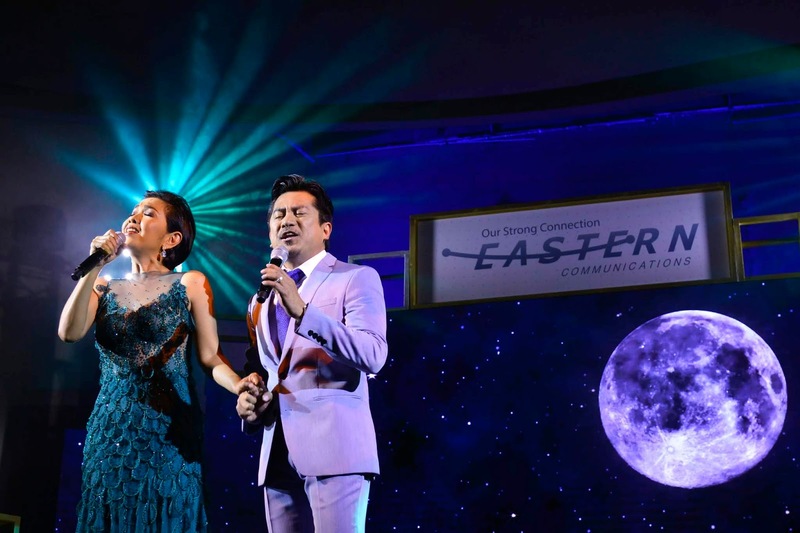 Famed theater artists Isay Alvarez and Robert Seña serenade guests with their stunning rendition of popular songs and Broadway hits during the Eastern Link VIP Night. “One of Eastern Communications’ purpose is to bring back the human connection in everything that we do and that includes reaching out to others our community. We partnered with Humanility because we share the same cause and believe that we can empower less fortunate children through education. Having them here and being able to introduce them to our customers made this night even more special to us,” said Atty. Aileen Regio, Eastern Communications Co-Coordinator. 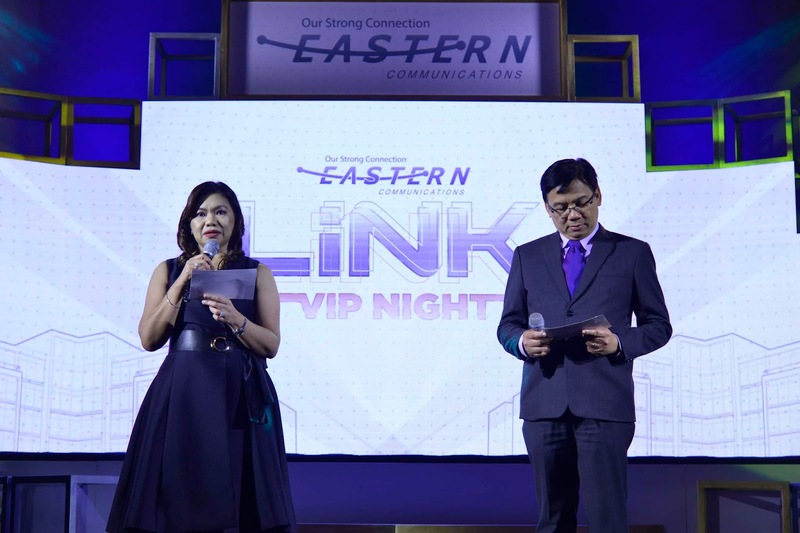 Members of the Eastern VIP Link Club can look forward to more activities this year as Eastern Communications continues its push to provide stronger connectivity to more enterprises and emerging business in the country. 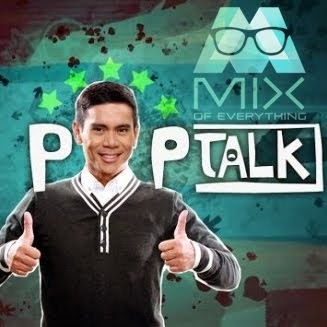 For more information on Eastern’s VIP Link Club or its products and services, they can like or follow facebook.com/easterncommph/ or visit eastern.com.ph. From left: Singer Robert Seña, Eastern Communications Coordinator Atty. 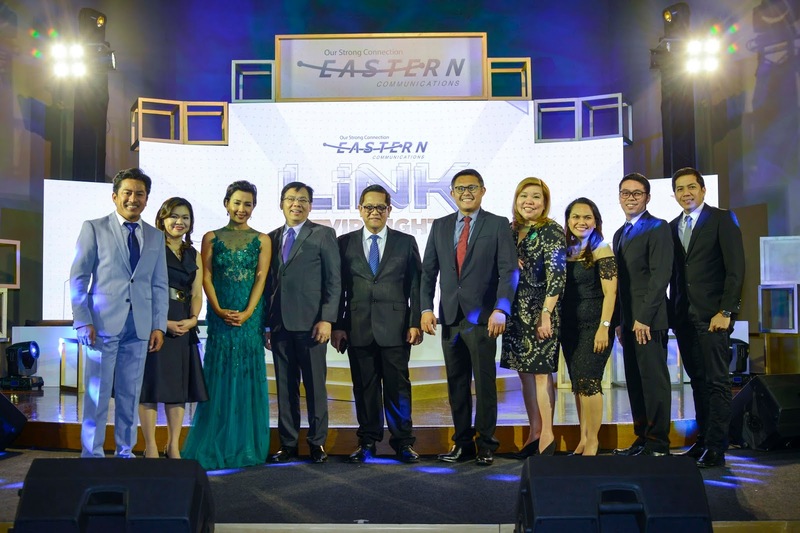 Aileen Regio, Singer Isay Alvarez, Eastern Communications Coordinator Ramon Aesquivel, Excellence and Customer Focus Head Bernie Bernardino, Product and Innovation Head Edsel Paglinawan, Marketing Division Head Catherine Muynila, Human Resources Head Anilene Cometa, IT Head Rex Evangelista, and Co-controller Omar Latorre at the Eastern Link VIP Night. Swosh! Just like that, your laundry is done! #DewDay powers thrillseekers and gamers!